My best friend is obsessed with My Chemical Romance, Gerard Way, and this series, so I was pretty excited to find it on hoopla. We usually have pretty similar opinions, but not in this case. I’m so sorry, but this was not good. I’m usually pretty forgiving with graphic novels. They’re what I turn to when I want a quick, easy-to-understand story. I don’t think I’ve ever before given a graphic novel one star. But this one… I just don’t really understand what Gerard Way was going for here. This book was a mess. Like, I’m not even sure where to start. I guess I’ll start with the complete lack of plot. Don’t get me wrong, things happen, but I can’t call what happens in this book a “plot.” It’s more like a collection of ideas that are tossed together and abruptly forgotten about. The ideas might be good if they were actually expanded upon, but they’re not. 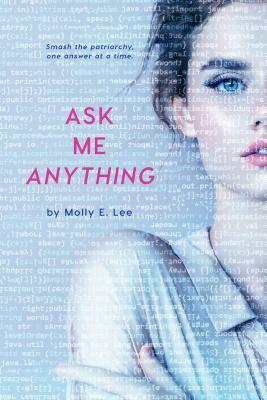 Overall, it was just a very choppy and disjointed story. The characters don’t seem to have motivations for their actions. And, honestly, even after reading about these characters for nearly 200 pages, I couldn’t tell you any defining characteristics about them aside from their appearances. There’s the really tall one. The girl who looks like a violin. The kid. I think violin girl is named Vanya, but I can’t remember anybody else’s name and I only finished this thing like an hour ago. I didn’t mind the art style (that’s about the only positive I can come up with), but there were way too many words shoved onto almost every page. If I wanted to read blocks of text, I would have picked up an actual novel and not a graphic novel. All in all, I’m just incredibly disappointed. I can’t help but feel that this was published solely because Gerard Way is famous, and one thing I hate is celebrities thinking they’re allowed to publish bad books just because they’re famous. (See also: Let’s Just Say It Wasn’t Pretty by Diane Keaton.) I had checked out the second volume of this series, too, but I’m about 103% sure I won’t be reading it. 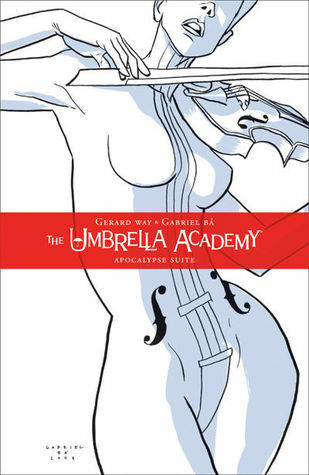 Have you read Umbrella Academy? Have you seen the show? I can totally understand your feelings on this. I reviewed this recently, and the only reason I didn’t give this a lower rating was because of nostalgia. This comic really is kind of a dumpster fire. I’m glad you agree with me, but I’m sorry you didn’t enjoy it more! I haven’t seen the show, but I’ve heard from several people that it’s really good! I might watch it eventually. You know how I feel about the comic and the show. I respect you. Art is to be loved and hated. That is the point of it. Now I’m going to go cry. Its ok… that’s art. Did you watch the TV show? They made the perfect changes to make it TV digestable… maybe it would work better for you? Have you seen the show? I haven’t read the graphic novel and I have middling and mixed feelings about the show so don’t feel compelled to read it sadly. I haven’t, but I’ve heard from a few people that it’s really good. I might watch it eventually, but since I don’t watch a lot of TV, it’s going on a pretty long list. What did you like/dislike about the show? I think it all came down to the characters. Klaus and Number 5 and their individua storylines are the best and I also adored what we saw of Ben. I thought Ellen Page was miscast which is a shame because I really like the actress and love her other stuff and I just couldn’t deal with the Alison/ Luther love storyline. It was stylised but in a good way. I just think the bits I loved (Klaus and Number 5) I really loved but then the bits I didn’t like I really didn’t like. I found it oddly polarising! Oh that’s such a shame. Since the show I’ve thought about trying out the graphic novels, since this and other reviews I’m not so sure now. It seems to be one of those things that you either love or hate. I would love to hear your thoughts if you end up reading it! Oh no, that’s so disappointing. I finished watching the show the other week and was thinking of checking out the graphic novel (thankfully I read this first)! I liked the show, but I was a little confused at first, so I can only imagine what that’d be like in written form. Too bad! So the show starts out confusing and gets better? I wonder if the second volume of the graphic novel is better, then. Maybe the graphic novel would make more sense since you’ve seen the show? Yeah, it was a little confusing at first although I was really pulled in by the idea of it, so I kept watching. I also didn’t know it was produced by Way (was a huge MCR fan back in the day lol)! It would be interesting to see how the show compares to the comics. Maybe the show will be better for you? Haven’t read the graphic novel, but I LOVED the show. Really well done, so kind of surprising that the source material might not be good? I was very surprised since I’ve had a few people tell me how good the show is! I’ve started watching the show but also felt that the characetrs were flat and just couldn’t get into it. Tried to watch episode 1 three times, then watched 2 and can’t remember anything that happened. So I guess it’s not for me either! Oh goodness, that’s not very reassuring!